Lighting Management: a triumph of led lighting. High brightness spotlights and hundreds of meters of high-quality LED strips. Cherry on top, two sources for optical fiber with RGB LED. Special is the pool lighting with color changing LED. Everything managed through Basalte SENTIDO keypads, here in their most classic version: satin white. Automation Management: shutters, blinds and window frames engines are all managed through the home automation system. Air Conditioning Management: The home automation system controls all zones independently of one another, ensuring to each its own comfort. The big living-kitchen area uses sensors placed at different points and performs an average of the detected temperature. Humidity probes provide for the automatic management of the fan coil, both for cooling and to avoid condensation. A forced ventilation system is automatically managed by the touch screen. Security: Integration with Tecnoalarm system is simple, and allows connection and disconnection of each area, and the display of alarm states directly from the home automation system or within the corresponding scenarios. Diffusion in the garden is entrusted to two Garvan SA210, Design omnidirectional speakers. Multiroom Audio: SONOS multiroom system, 7 independent zones, made with amplified player. The speakers are all invisible, Built-in the wooden panelling. The integration between audio and home automation is realized by the supervision and control server. Home Cinema: As for the Home Cinema, there is the trick, but you can't see it. The sheet is hidden near the fireplace. The projector, a magnificent Crystal Cube SIM2, is installed in a cabinet with automatic opening, controlled by the home automation system. The front speakers are all invisible, built in the front wooden panelling, as well as the surround. The subwoofer, a generous 240W of Garvan with dedicated Band & Olufsen ICE power amplifier, is also completely invisible. The engine is the latest generation amplifier, a YAMAHA RX-A1060, of adequate power to the system. TV: The TVs in the dining and living area are built in the wooden panelling. In order to ensure the best audio quality, they are connected to a dedicated amplifier. The speaker is a single in stereo mode, invisible type. In the bedrooms we installed two Loewe Connect with floor base. Multiroom Audio Video: The audio-video system is based on an HDMI KRAMER 6x6 matrix. Everything is managed by the supervision system, so you can share all decoders and other sources on all TVs with no remote control. The devices are all centralized, therefore no decoder or other accessories in sight, no cable hank near the televisions. Supervision and control: The management of the entire system is on iPad as is now tradition, with a new graphical interface developed by ClicHome to further enhance ease of use. Same goes for the iPhone. Televisions and audio-video system are managed comfortably from tablet, but for support were also provided dedicated remote controls linked to the supervision system. To support and to ensure the right functioning of everything even in the absence of network operation, we installed two wall 10 " touchscreens, one for each floor, connected directly to the bus. Realization times: 32 adw (actual days of work, including the realization of the electrical system). Comments: A complete system, designed with great attention to design, as you may notice from the use of Sentido keypads by Basalte, and from the invisible speakers throughout the house. With this system we started a real study on the creation of user interfaces, in order to make home automation use as intuitive as possible. Inspired by the latest developments and theories on user interface (such as Atomic Design) we have undertaken a whole new path, which we believe has already borne fruit. The technology used for the maintenance and online support system is also new. A new solution with which we can give the customer the maximum real-time support on all aspects of system operation. Remarkable teamwork, under the direction of the architect and in consultation with the woodworker, which let us "hide" all our electronics. To sum up: Continuous improvement, this would be the phrase with which I could summarize this system. Each installed solution, already tested, has been refined, improved. I believe that from here starts a new history of our systems, the pursuit of perfection in every detail. The network, interfaces, control, graphics, everything has undergone a thorough review. A real study to make sure that every system is better than the last one. Lighting Management: The lighting is characterized by the extensive use of LEDs and RGB LEDs. All directly dimmed on the KNX bus through specific dimmers. The keypads are ENZO by BASALTE, in the white glass version. Automation Management: All the shutters are controlled by the home automation system. 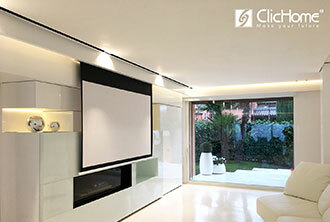 sheet and projector automation are integrated into the Home Cinema system and scenarios. Air Conditioning Management: air conditioners are controlled by the home automation system directly by IR-KNX interfaces. The actual management is entrusted to the on wall touch and to the iPad. Security: The alarm system is integrated in the KNX bus through a KNX-RS232 interface. Video Surveillance: We realized the surveillance system with HD-SDI latest generation cameras. The DVR unit allows the control from iOS devices either locally or via internet. Access Control: Access control system with fingerprint reader. Supervision and control: The system is based on a RTI XP6 control unit. The main user interfaces are the 2 supplied iPad of the house, to control both locally and via Internet. The on wall motorized bracket for iPad (iRoom) confirms the intention to use the iPad as a true master device for supervision and control. A 9" touch screen on wall performs as leading supervisor, wired to the system via LAN. The XP6 integrates the different functions: home automation, multiroom audio, audio-video and TV and Home Cinema control. Experimentally, we used the RTI unit as a communication gateway between KONNEX and Sonos sound system, to allow the control of basic audio functions from Basalte keypads. The management of home cinema is supported by a RTI T2x remote used in WiFi communication with the control unit. Multiroom Audio: The audio system is based on Sonos, made of 4 independent areas. The system is fully integrated into home automation via RTI. Multiroom Audio Video: he audiovideo system is based on a Gefen ToolBox HDMI Matrix 8 inputs, 8 outputs. The matrix is directly managed by RTI in serial. All sources connected to the matrix, such as the Apple TV and the four SKY receivers are directly controlled by RTI. Kaleidescape: Supporting the Matrix Audio Video system, we provided a Kaleidescape Cinema One, which acts as a centralized bluray player, fully integrated in the home automation system. The integration RTI-Kaleidescape is perfect enough to make the Kaleidescape App essentially useless. 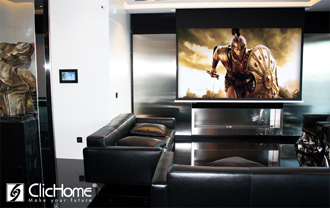 Home Cinema: The system is based on a avielo Radiance projector and on a 3 meters motorized sheet. The speaker, integrated in the RTI system is a Yamaha AVENTAGE RX-A3030. All the surround speaker system is based on in wall Garvan products. The three front speakers are Garvan SIC316, integrated in the piece of funriture. Monitor: For the kitchen area, we installed a disappearance screen in a mirror 180x180 cm. The monitor is managed directly by RTI in serial. The other areas are equipped with SAMSUNG ULTRA HD screens, while the main bedroom with a B & O.
Realization Times: about 12 actual working days. Comments: Here the RTI system has been pushed to its limits. The integration covers a wide range of different devices, from simple control via IR (we saturated all the inside doors to XP6) to controls via RS232 and via IP. The control unit has been used as a gateway, sending commands from driver to driver. For what regards the home automation, mention should be made to Basalte, here for the first time used in the glass version, integrated with the management of the RGB LED. The synchronization between the colour of the cross on the keypad and the light in the room was really a touch of class. The audio video is extremely complete. Innovative solutions abound, like the screen in the mirror of the AdNotam kitchen, or the total disappearance home cinema. The use of the matrix in combination with the control from the iPad has brought down all my prejudice it is excellent. To sum up: audio-video and home automation integration at the highest levels, for a system that represents from many points of view the state of the art. The iPad confirms itself as the best solution for integrated control of home automation and audio-video devices. Lighting Management: The lighting system, entirely on Konnex bus, is controlled by infinity keypads in black glass, with LED backlighting. Each keypad has internal ambient light sensor to set the brightness of the LED according to the environment. Setting the intensity of the lights, mainly LED, is assigned in part to actuators 0-10V and in part to LED dimming actuators directly on Konnex bus, both of constant current and constant voltage type. In fact, with this system we have proven the ability to handle and dim any type of LED lighting, directly on Konnex bus. Automation Management: Curtains and blinds are controlled directly by the Konnex actuators. On the home automation system were also wired some of the fixtures. The logic module provides the internal self-blocking between fixture and curtain, avoiding accidental breakage thereof. The weather station installed activates the automatic closing in case of strong wind, as well as managing the switching on of external lights by sunset switch. Air Conditioning Management: The air conditioning system provides both floor heating and Mitsubishi canalized heating plant. The heating is controlled directly by the Konnex ambient thermostats. All thermostats are aesthetically integrated into the design of keypads, in black glass with led display. The Mitsubishi system is integrated into home automation with a Mitsubishi-KNX interface. In this way the control of all internal machines is brought on the iPad / iPhone and touch screen. Intrusion detection Integration: The home automation system is integrated into the Intrusion detection system via RS232 serial. This allows not only the management by touch screen, but above all the ability to connect and disconnect scenarios areas. Multiroom Audio: Includes 8 independent zones, each served by the SONOS system. The loudspeakers in each room are the GARVAN SIC216, while for the bathrooms we used SIC112S, single stereo speaker. Home Cinema: The Home Cinema salon is of the highest level, but above all, completely invisible. The sheet (250 cm wide) is powered and reenters completely in the plasterboard, as well as the projector, housed in the magnificent PD2 Future Automation. The front speakers, GARVAN SIC316, are hidden behind an acoustic sheet that covers the whole width of the front wall unit. The surround speakers are AMINA AIW3X completely invisible. The Subwoofer is built into the boiserie of the salon. The part of the amplification is assigned to a YAMAHA AVENTAGE 3030, the latest creation of the Japanese group. All strictly integrated and hidden in the front wall. Finally, the projector, a Quantum Avielo And with standard optics, it has immediately kept up with expectations. Supervision and control: The supervision system is based on the now tested XP6 unit, combined with the IP-KNX interface to control the home automation system. To complete the system, a RTI RK10, strategically located between the living area and sleeping area, and the monitoring via iPad, active both locally and via Internet. To control the Home Cinema system we used the brand new T2x with ZigBee communication, which not only replaces all other remotes, but solves the problem of controlling a number of devices hidden inside the wall unit "custom-made". Realization Times: about 18 adw (actual days of work). Comments: A plant of the highest quality, and not only for what concerns the audiovideo and home automation. All the details have been carefully thought out, such as the choice of thermostats integrated into the design of keypads, or of RK10 as main touch, placed in the perfect position. The audio system SONOS resulted perfectly integrated into the home automation system with supervision of RTI, thanks to the new software SONOS-RTI, used here as an experiment (the driver is not yet available). Also interesting is the integration with Mitsubishi, which allows the KNX to convey directly with the concentrator AG150 over the network using XML. A truly efficient solution, which proved to be also extremely fast and reliable. Experimental was also the IP control of Samsung Smart TV hidden behind a glass in the main salon, by a new RTI driver, also this in beta version. Finally, a gem was the very scenic choice of the bio ethanol fireplace directly controlled by Konnex automation and then by the touch and the RTI supervision system. To sum up: One of the most complete systems realized until now by Clichome, integrated into a magnificent architectural project, in one of the most beautiful and exclusive areas of Naples. Lighting Management: The lighting provides an extensive use of dimmable LEDs, both inside and outside. Therefore, for the control we opted for a system based on the standard DALI, interfaced with the home automation system through a Schneider gateway. The system is controlled by the SENTIDO Basalte keypads. All areas are provided with presence sensors and lighting flat on wall, used both for light management, and as sensors for intrusion detection system. Automation Management: The management concerns the outdoor awnings which are managed directly by the automation supervisory system. The weather station installed activates the automatic closing in case of strong wind, as well as managing the switching on of external lights by sunset switch. Air Conditioning Management: The air conditioning system, both hot and cold, has been realized with a fan coil system. It is controlled using a keypad with OLED infinity display Deseo by Basalte. While the living room area is controlled directly from the touch screen. Supervision and control: The system can be managed as a whole from a 5" touch screen placed in the bedroom area. In the living area is installed a RTI 10" touch . The supervision system is based on RTI unit, to which the iPads are connected, both locally and via Internet. The RTI system controls the home automation through an RTI KNX Interface on IP, while the audio system through the RTI-Sonos interface. Multiroom Audio: The multiroom audio consists of three areas, outdoor living and principal. The system is based on SONOS, integrated in the home automation system through RTI. For indoor areas have been used in wall loudspeakers, while for the garden we installed 4 omnidirectional GARVAN CUBE speakers corten effect. In support of the outdoor area we added two power amplifiers APART CHAMP. To sum up: Home Automation and Design have always been the key words of all ClicHome systems, but in this case we have went one step further, and instead of speaking of a home automation built into the design of the house, we can speak of a home automation at the service of design. Therefore we are pleased to have given to the designers who have involved us one more tool to accomplish their work. Lighting Management: Lighting is fully managed with Konnex bus. The circuits of the living area are all dimmed with incandescent lamps. The load on some dimmers reaches 1000W/canale. The buttons used for the management of lighting and automation are the series SmoothLine Eclettis, some in white version of and some in steel version. Power sockets and services are coordinated. Automation Management: The management includes control of motorized blinds in all rooms, as well as sheet and motorization bracket for projector home cinema. Air Conditioning Management: The main conditioning system is the DAIKIN VRV. The home automation system controls the DAIKIN in bidirectional mode directly from Konnex bus through an interface DAIKIN VRV-Konnex. The service rooms are also equipped with a ventilation system managed by the home automation. Two machines for the air treatment are activated by the Konnex home automation. Supervision and control: The plant is equipped with a supervision and control system based on RTI unit. 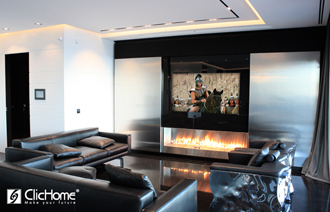 The main touch screen, positioned between the entrance and the living room, is a 10" custom graphics interface. Furthermore the system is controlled from the iPhone and iPad, both locally and via Internet. Through the touch and single tablet you can control both the home automation of the components multiroom audio and home cinema. Completes the supervision and control system, dedicated in particular to the cinema area, the touch screen remote control T3V +, from which you can manage all devices in the home cinema room as well as home automation components for lighting, climate and automation. CCTV, IP Camera AXIS input of the integrated system of supervision and control. Audio Multiroom: The audio multiroom has been realized with the SONOS system. Each room is equipped with its own SONOS player, positioned in a central rack custom-made. In all areas have been used AMINA total disappearance loudspeakers. The living area is connected to the home cinema speaker system for the sound diffusion. Video Multiroom: The distribution of audio-video contents has been realized with Colan system. The plant is equipped with a 4TB server, and a 3D player to serve the home cinema area. Home Cinema: The Home Cinema System has been realized with a DaLite total disapperance screen of 3 meters, Mitsubishi HC7800 projector and PD2 ceiling bracket of Future automation. The amplification is entrusted to a MC12 Lexicon and a Lexicon final GX. The speakers in a 7.1 configuration are GARVAN in D'Appolito configuration for the front, installed in the furniture custom-made, and Garvan flush plasterboard with an internal angle of 30° for the surrounds. The subwoofer is a GARVAN WAE240. Comments: It'a difficult plant to comment. Of course, for size and choices we have before us a 100% Luxury plant. For the home automation part, should be noted the dimmers on Konnex of 1000W used for the management of ignitions in the lounge and the integration, perfectly achieved, of Daikin air conditioning system. For supervision has been used RTI, with the latest touch screen RK10, which was done immediately appreciate for the clean design and the graphic quality. The supervision software realized was designed with the customer and under the guidance of an interior designer. The aim has been to realize a simple and complete menagement, but that would not result dispersive in the use. The logic followed has been to distinguish for rooms rather than for functions. The scenarios were very transversal, involving all systems, such as lights, automation, climate, audio and home cinema. For the multiroom we have opted for solutions rather simple, such as the SONOS and the Colan, giving priority above all to the simplicity. The sound of the home cinema part has been realized without compromises but the needs of interior design. For the projector, the choice was circumscribed by the will of a projector capable of reproducing in 3D, and in this the Mitsubishi does not disappoint, giving thrilling experiences in 3D worthy of a cinema. To sum up: A system of which we are proud from all points of view, the technical quality of the work done, the effectiveness of the choices made, to the excellent relationship established with the customer on site and with the interior designer who has guided us. A plant that has given us the very special pride to represent the quality of Italian technicians in Russia. Lighting Management: Lighting mostly managed with dimmer for incandescent lamps on Konnex bus. All areas are covered by ceiling sensors of presence and brightness. Management exclusively by wall touch screen. Automation Management: shutters controlled by Konnex actuators 10A and managed directly by wall touch screen. Air Conditioning Management: Heating and cooling systems combined. The cooling system is entrusted to DAIKIN split, fully integrated with the automation bus Konnex through bidirectional interfaces Konnex-Daikin. The heating system is on the floor, with on / off valves. The circuit heat management is integrated through condensing boiler or through traditional fireplace. The system provides automatically for the integrative power up of DAIKIN in winter mode in reinforcing to the floor system when the temperature gradient between setpoint and read temperature exceeds 2 °. Supervision and control: The whole apartment is managed directly and exclusively by touch screen 3 "Zennio. General supervision by iPad was made through a control unit RTI, which also provides for the control of several audio-video devices and the management of the system via Internet. Times of realization: 6 about adw (actual days of work, only for programming and setting up). Comments: This is a complete and innovative home automation system. For the first time we have created a system without any switch or home automation keypad. The management is entrusted exclusively to the touch screen, one for each room. Everything was possible adding to the touch sensors of presence and ambient light in each room. The system can operate in automatic and manual modes. In automatic mode, all the lights are controlled by sensors, which also provide for the monitoring of the level of ambient light. In manual mode the lights are switched on and set by the touch screen. Also the control of the DAIKIN split is entrusted exclusively to the touch, which also act as ambient thermostat in each room. The system automatically selects when you need to turn on the split and when underfloor heating is enough. To sum up: A system of innovation almost pioneering, in which is completely abandoned the logic of a traditional system, leaving to the home automation the possibility of express its full potential. Obviously the skills of ClicHome joined a will innovative and free of prejudices on the part of the client, who has had the pleasure of experimenting with us new solutions. Air Conditioning Management: Heating and cooling with floor radiant and fan coil. The system is built with dual-circuit hot and cold and valves 6-way. The system works both hot and cold with regulation valves 0-10V. The fan coil is in support of the radiant. Each thermoregulator ClicHome also controls the level of environmental humidity, avoiding phenomena of condensation. 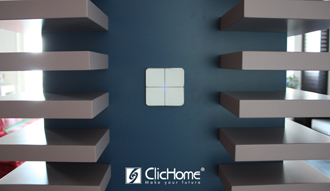 Supervision and control: Supervision and control software "tailored" by ClicHome. By the supervisor in reception you can set the temperature, switch from Summer to Winter mode, block the local keypad, see the status of the area. Times of realization: about 4 adw (actual days of work, only for programming and setting up), the installation took about 10 adw by the electrical worker of the Hotel. Comments: This is a temperature control system and automation definitely complex, both from a hydraulic point of view that of management. Each room is composed of 3-4 independent climate zones, and each zone has to manage two valves 6-way, as well as the speed of the fan coil. In addition to the thermoregulation each "thermostat" also controls the level of humidity and activates the fan coil to dehumidify in relation to the dew point (relative humidity measured). The management of the valves is of modulating type, with separate range for hot and cold on the same valve (0 to 5V hot from 5 to 10V cold). In this way the thermoregulator can switch from summer to winter mode without the need to act on external machines, which remain always in function. All the products used, as well as the software, have been realized ​"custom made" and according to the specific requests of the final customer. The communication between the bus floor has been realized in optical fiber, with couplers for optical fiber synthetic optobus. The individual fieldbuses are standard serial 485. To sum up: This is a system realized truly "custom made" in which nothing, from the single components to the firmware to the supervision software, is standard... also because there is no standard application or product to carry out the control of a climate system of this type. The choice of a serial standard 485 has proved successful, especially for the easy customization of the software. Installation times have been reduced to the bone, due to the programming made of all of the components before they were delivered to site. 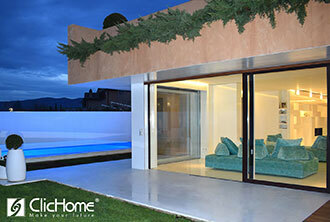 Actual application, proof of the great ability to customize and adapt to customer specifications by ClicHome. Lighting Management: All lighting is managed directly on the bus Konnex, including LED and dimmer in the several rooms. The keypads for the control of the entire system are SENTIDO of Basalte in brushed steel version. Air Conditioning Management: The heating system is unique throughout the apartment managed by home automation through touch screen. The cooling is a VRV Daikin. The keypads SENTIDO act as thermostat for each local area, interfaced then with the VRV both through contact on built-in actuator, both through Konnex-Daikin interface. Management Automation: All shutters are managed directly on actuators Konnex, of course each room has single and general commands for all automations. Inevitable are the entry and exit scenarios that provide to simultaneously manage lights and blinds. Local control: supervision is entrusted mainly to iPhone supported for supervisory functions by a touch 3.5 "in the center position. 3D Home Cinema: the cinema room is made in the main hall, with a 3 meters screen concealed in plasterboard; projector HC9000 FullHD 3D concealed in plasterboard and audio system retractable with YAMAHA DSP-Z7. Comments: automation system of quality but without "special effects", home automation is all on Konnex, with the wonderful SENTIDO of Basalte dominating. The integration with the climate is limited, control of automation complete. In supervising everything is actually entrusted to the iPhone and iPad, showing once again all their versatility and effectiveness. The Home Cinema deserves a separate discussion. The HC9000 projector is the latest Mitsubishi addition, one of the few in 3D at the time of system installation. Regardless of the "pearl" of 3D is a great projector, with the right balance of contrast and a brightness that does not go into crisis even with the wonderful side window with the view of the gulf fully open. Is also excellent the installation flexibility, thanks to an optics and an electronics able to adapt easily to any context. The projector is placed in a motorized bracket concealed in plasterboard. Obviously controlled by the home automation system, as well as motorization of the screen. The front speakers are three GARVAN SIC316, three-way D'Appolito configuration of 150W RMS, placed behind the screen. For surround sound it has been chosen a configuration with minimal environmental impact, with complete disappearence speakers planar emitting 60W. The amplifier is the DSP-Z7, flagship model of YAMAHA. An amplifier with an electronics and a setting up "out of the ordinary" and power to manage the seven speakers connected. Last note, the wonderful GARVAN subwoofer, aesthetically incomparable with qualities of 0 noise and a remarkable sound pressure, considering that it is only 100W RMS. to sum up: System automation is not pushed, but of quality, with a great home cinema system, and perfectly integrated with the environment from the architectural point of view, with solutions of high quality and design. Access Control: The access control system is realized on bus Konnex with ABB Sace products. The external reader handles the opening of the lock of the room, while the internal reader provides for the activation of the climate and of electrical equipment including lighting. The management of access control system is entrusted to the dedicated software ABB MiniMac3. Air Conditioning Management: All rooms are equipped with a thermostat to control 3-speed fan coil. The set point is set up locally by the client. To ensure energy savings, as you open the windows, the thermostat automatically switches to standby mode. Video surveillance: The structure has been equipped with a video surveillance system to cover the entire perimeter connected on server accessible over the network. Comments: The plant was originally for the only management of climate on Konnex bus from reception. In a second step, it was decided to add on the same bus of the building automation the system of access control through budge, this particularly in order to optimize energy savings obtained through the management of climate. The structure has been later enlarged with a SPA connected to a wide outdoor area which includes a pool and a fitness area. The Konnex bus proved in this case all its flexibility, allowing to expand the system beyond its original purposes practically without structural limitations. Outstanding the access control system ABB, which has proved above all very solid, even in harsh environmental conditions. The system works in the white list, so the TAG authorized to access are sent to the device from the reception software through two variables (1 byte and 14byte). The white list is then stored within the device, which makes the system stable and prevents the telegrams from the access control from "clogging" the bus. The Minimac software of cards management is not the most intuitive. However, it is rather stable and once "got the hang", easy to use. To sum up: access control system integrated into the climate management on Konnex bus. Excellent example of scalability in time and functions of a Konnex bus. Lighting Management: The entire structure is managed exclusively by presence and ambient light sensors. In fact, there are no traditional switches or buttons. The light is dimmed through sensors to ensure constants 500Lux on the worktop. All lights are managed directly on three independent DALI lines, each line is interfaced to KNX home automation with a KNX-DaliG ateway by Schneider. Automation Management: The home automation system manages directly the curtains and transom windows of the meeting room and training room. Local control: A 3.5" touch screen by Zennio controls the functions of the meeting room bypassing, if necessary, the two sensors in the room. An IR Zennio remote control replicates the functions of the touch screen in the meeting room. Comments: The plant was designed and realized with the aim of optimizing the energy consumption for lighting and at the same time ensuring the comfort of work for employees of the post office. The choice of DALI for the management of the lights was almost obligatory, since the number of lamps installed. Just on the second floor are no less than 100 lamps. The control has been integrated without any problem on the KNX. The interface Schneider is flexible and fully bi-directional in communication. Great the Zennio touch doing his duty and in an environment, such as post offices, where its simplicity and sturdiness are really appreciable. To sum up: a building automation system realized with a specific purpose and few frills. Result fully achieved. An example for the entire public sector of how should be thought the new structures. What a pity the climate has not been integrated in the bus Konnex because of previous design choices. Lighting Management: the whole area is managed with dimmer control on 1-10V. Hall and rooms are equipped with LED strip in RGB controlled in DMX directly from Konnex. The control keypads are all Basalte infinity SENTIDO series. Air Conditioning Management: Mixed system with radiant floor heating and fan coil. The climate system is managed by dedicated electronic cards that interact in ModBus. The sensors are integrated in the keypads and communicate with the climate control cards through an interface Konnex-Modbus. Automation Management: blinds and curtains are managed directly by home automation. The actuators used also allow a proportional positioning of automation to be integrated in the scenarios. Burglar alarm realized with central and components Bentel. The central is designed to be integrated in the future on the KNX bus. The video surveillance system provides a total of 4 cameras with dedicated web server. The monitoring can be both by PC and touch screen. Access Control with fingerprint reader. Local control by wall touch screen 10 " with supervision software integrated. Control from the iPhone and iPad. Sound diffusion: multiroom of 5 zone realized with ​​SONOS and integrated in the control from iPad. For the living area have been used complete disappearance loudspeakers by Amina AIX5. Comments: It is a plant without compromises, both in terms of design thanks to keypads Basalte SENTIDO, both from a technical point of view, with the Konnex bus that manages all the functions of the house. The excellence of this system is the extreme level of integration achieved, demonstrating the great potential of using an open protocol like Konnex. The integration of RGB LED has been realized with an interface KNX-DMX. This way by home automation you have the total control of all the possible combinations of LED colors, without any difficulty even in direct control by keypads or touch screen. The integration of the Climate has been realized with a Konnex-ModBus gateway. The conversion tables have been realized directly by ClicHome for the system in question. To avoid slowdowns in the bus, response telegrams were filtered, while the update of the temperature values ​​read on the Konnex bus have been limited to 1 reading every 40 seconds on the ModBus. The use of this advanced form of integration has allowed to use for the climate directly the electronic boards supplied by the house, which incorporate evolved operation logic to optimize the combined use of fan-coil and radiant. The main purpose is to ensure the maximum comfort and avoid possible condensation phenomenon linked to radiation. A probe of air humidity on Konnex bus constantly updates the relative value on all ModBus cards, in order to immediately power the dehumidification machines, according to the read temprature and the dew point calculated. Excellent the Schneider 10" touch used. If, from the side of graphic customization, proved to be a bit limited, nevertheless is incredibly fast in the command execution and reliable. To sum up: An evolved home automation system. A Konnex system pushed to the highest levels of integration. The best ever infinity keypads. I do not think you could ask for more from a home automation system. Just a shame that the audio video part is limited to the multiroom SONOS. 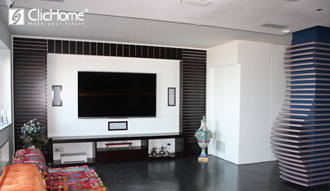 Automation Management, blinds and curtains are managed directly by the home automation. The actuators also allow a proportional positioning of automation to be integrated in the scenarios. The surveillance system provides a total of 4 cameras with a dedicated web server. The supervision can be done both from PC or from the touch screen. Comments: This is a system without compromises, both in terms of design through SENTIDO Basalts keypads, both from a technical profile, with the Konnex bus that manages all functions of the house. The integration of RGB leds has been realized with a Konnex-DMX interface. In this way from the automation you have the complete control of all possible combinations of led colors, without any difficulty, even in the direct control by keypads or touch screen. The integration of the climate part has been realized with a Konnex-Modbus gateway. Conversion tables has been realized directly by ClicHome for the system in question. To avoid delays in the bus response telegrams were filtered, while the updating of the temperature values read on the Konnex bus were limited to one reading every 40 seconds on the ModBus. Using this advanced form of integration allowed to use for the climate electronic cards provided directly from the house, incorporating advanced operating modes to optimize the combination of fan-coil and radiant. The main purpose is to ensure maximum comfort and avoid the possible condensation phenomenon related to the radiant. A humidity sensor of air on the Konnex bus constantly updates the value on all ModBus cards, in order to immediately send the machines in dehumidification according to the temperature read and to the dew point calculated. Excellent the touch 10 "Schneider used, that if on the side of the graphic personalization has showed to be a bit limited, on the other hand is incredibly fast and reliable in the execution of commands. In summary: An advanced home automation system. A Konnex system pushed at the highest levels of integration. The touch keypads are the most beautiful of all. I do not think you can ask for more from a home automation system. Just a shame that the audio video part was limited to the multiroom Sonos. Sistema Home Theatre Custom con 4 diffusori surround incassati Tannoy IW62 TDC, 3 frontali YAMAHA NS-700, amplificatore YAMAHA RX-V2065, cablaggio personalizzato e predisposizione Proiettore. Tempi di realizzazione: 40 ggll (giorni effettivi di lavoro, c.ca). Commenti: Impianto Standard realizzato con la tecnologia MyHome di bTicino, dove la parola d'ordine è stata “semplicità”. E' un ottimo esempio di impianto domotico per un appartamento di dimensioni medie con un discreto livello di integrazione. L'impianto HT realizzato su misura ha dato buoni risultati, amplificatore da considerare un entry level provvisorio, per poi passare a qualcosa di più allineato alla qualità dei diffusori impiegati. In Sintesi: Impianto semplice e funzionale, con un buon livello di integrazione. Un ottimo esempio di domotica completa e a costi competitivi. Integrated digital video door phone with 2 external cameras connected to the system of home automation. Time of Realization: 60 adw (actual days of work, about). Comments: Plant of remarkable dimensions and value, realized maximizing the "standard" package and integrating advanced features of audio and audiovideo. The integration is total and the customization according to customer requirements, maximum. Remarkable are the efforts in the realization of sets of lighting design. Control from iPhone once again shows all its advantages, so much to replace in everyday use the most famous and expensive touch screens. The bTicino MH200 controller of the scenarios has led this installation to the functional sophistication of a "top" system, realized with KNX technology. Significant the extent and customizing of the RTI touch dedicated to audio / video. In summary: Total home automation for a system in which everything is integrated. Scenarios like the CINEMA control from the projector to the lights, from the motorization of the sheet to the room temperature. If the aim was to bring our STANDARD system to the highest levels, we have perfectly succeeded. This plant has not much to envy to many TOP plants. Very remarkable the Home Cinema, with a DLP CHRISTIE projector who mocks the many commercial projectors and brings home the true full hd cinema.